Ada pertanyaan untuk HI Ein Gedi Hostel? Dirancang untuk wisata bisnis dan plesiran, HI Ein Gedi Hostel terletak strategis di Ein Gedi, salah satu daerah lokal paling terkenal. Dari sini, para tamu dapat menikmati akses mudah ke semua hal yang dapat ditemukan di sebuah kota yang aktif ini. Untuk pilihan lokasi jalan-jalan dan obyek wisata lokal, Anda tidak perlu pergi jauh-jauh karena hotel ini terletak dekat dengan Kebun Raya, Ein Gedi, Cave of Letters. HI Ein Gedi Hostel juga menawarkan berbagai fasilitas untuk memaksimalkan pengalaman menginap Anda di Laut Mati. Untuk kenyamanan para tamu, hotel ini menawarkan resepsionis 24 jam, fasilitas untuk tamu dengan kebutuhan khusus, penyimpanan barang, Wi-fi di tempat umum, tempat parkir mobil. Semua akomodasi tamu dilengkapi dengan fasilitas yang telah dirancang dengan baik demi menjaga kenyamanan. Daftar lengkap fasilitas rekreasi tersedia di hotel termasuk taman bermain anak, taman, ruang bermain. Apapun tujuan kunjungan Anda, HI Ein Gedi Hostel adalah pilihan istimewa untuk menginap di Laut Mati. Karena adanya peraturan pajak lokal, warga negara Israel wajib membayar pajak PPN yang dapat dibayarkan di hotel pada waktu check-in. Pajak ini tidak termasuk di dalam biaya pemesanan hotel dan akan ditagih oleh pihak hotel pada saat check-in. Ketika memesan 5 kamar atau lebih, kebijakan yang berbeda-beda serta hal tambahan lainnya akan berlaku. Overall me and husbands experience was great. Check in was easy and everyone was friendly. The room was clean and had a beautiful view of the Dead Sea. Since this is a youth hostel, it was full of youth. Thankfully our room was on the 3rd floor so the buzzing of the groups of kids outside did not disrupt us. We hiked Masada in the morning, which was about a 15 minute drive. We hiked Ein Gedi before check in which is about a 5 minute drive. Breakfast was fresh and good. There were just a ton of kids to try to deal with to get food, but it was manageable. I would stay here again. I was really overwhelmed by the beauty of the nature surrounding the hostel. But you have to be aware of the fact that there is no near open beach to the dead sea, you'd have to drive for quite a while. But the hostel and the view were really beautiful and made up for that detail. There are unfortunately no near grocery stores, so better bring some food and drinks. Unfortunately there is no beach in Ein Gedi, had to drive do Ein Bokek. The hostel was clean and nice. Rooms are clean, cool, quiet and comfortable. Convenient location for Masada visit. So easy to steel right over to the park and start hiking. Front desk staff was notably warm and helpful. Room was a bit stuffy and hot unless balcony door open. Great views. Superb location. Visited the Ein GedI nature reserve. The room was large, comfortable, and clean. Very welcoming helpful staf and in the restaurant were very friendly and helpful. The location of the hostel is ideal for Masada and also for the Dead Sea (rather than Ein Bokek). This location should be preferred for those who don't want the "tourist" locations of Ein Bokek as it is located close to Masada and the Ein Gedi Nature Reserve. Superb location. Our balcony overlooked the Dead Sea. We also visited the Ein GedI nature reserve which was right next door. The room was large, comfortable, and scrupulously clean. The staff at reception and in the restaurant were very friendly and helpful. Ein Gedi Hostel is in a good location right next to a nature preserve, short drive from the EG Spa & Masada. Our room was quiet at night and clean. Breakfast was the weakest link. Got our money's worth though. 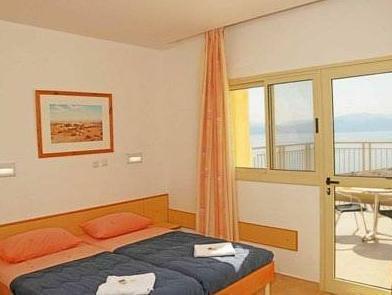 The room was clean and fresh with a beautiful sea view. Our peaceful time was destroyed by group of wild, noisy school boys which left us without breakfast and unhelpful chef. Check if schools are coming before booking. Comfortable room and very entertaining sharing facilities with a large youth group.